Big Chemist.com is an online store for India from where one can buy medicines , beauty products , Skin care and Hair care products , Health care devices , Health care supplements etc. This site was founded in the year 2013 to offer quality healthcare services and medicines online in India.They have more than 1,50,000 products listed on their website . They have skin care products from top 50 brands . In compliance with Drug and Cosmetic Act and Rules, they don’t process requests for Schedule X and other habit forming drugs. For Schedule H and H1 drugs a valid prescription from a registered medical practitioner needs to be uploaded with Order. They offer good discounts on all products including medicines . They have a reward system also . Every time one places an order at BigChemist they earn some points depending upon amount spend , those points when accumulated can be used to get good discounts from the site on their next purchase . They exchange and return policy are also simple . They offer free shipping on orders above 199 in NCR regions for other Pin codes some shipping charges are there depending on location . Few months back I have placed and order at this site . 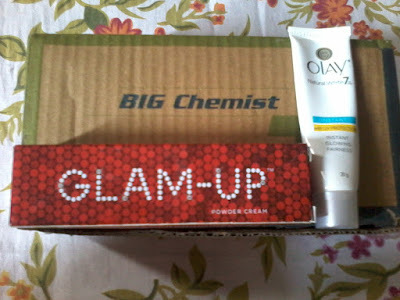 I had ordered some skin care products , because of some offer that time my shipping was free and also I got my products with in 3-4 days of placing order. The products were nicely packed and my parcel reached on time . So my first shopping experience with them was good . And I earned some points also with this order . Last month I had participated in Women’s day contest on facebook page of Bigchemist . I was chosen as the winner of that contest . I liked both the products . So my experience with this site is good . One can also join their facebook page and get latest updates and participate in their contests and Giveaways .